Our story starts with Herb Kenrick, a rolling meat market that serviced the south St. Louis area with fresh meats. Today, we still use Herb’s recipes for some of our original sausages and our Kenrick’s landjaeger, a dried, cured smoked sausage – much like a Slim Jim but more delicious! Joe Weinmann, better known as “Joe the Butcher”, purchased Kenrick’s Meats. 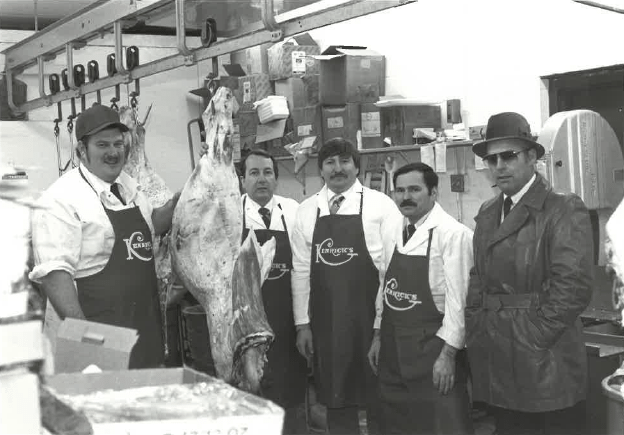 At that time, Kenrick’s was a small time butcher shop on Gravois Road in Affton, MO that specialized in sides and quarters of beef. Joe, along with his head butcher Larry, operated the small butcher shop. It didn’t take long for Joe and Larry to need help managing the growing business. So in 1980, Joe’s brother John was brought aboard and Kenrick’s moved to Weber Road. Joe & John were asked to cater the wedding of one of their employees who was wanting Kenrick’s homemade roast beef. Along with their wives and long-time employee Dan, Kenrick’s successfully completed the event and Kenrick’s Catering was born! Kenrick’s started the wholesale division recognizing the growing need for restaurants seeking quality, local food. We have grown to service over 100 local restaurants! We also offer fundraisers for church groups, Boy Scouts, and other organizations looking to raise money. Kenrick’s moved to its current location at 4324 Weber Road St. Louis, MO. One block off of Hwy 55 and Bayless Avenue in south St. Louis County, this new location is three times the size of the old location, giving opportunity for growth. Have questions about our meat market, catering or other services?